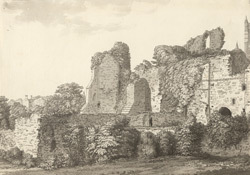 A south view in ink of the ruins of the bishop's palace at Lincoln. Constructed in the late 12th century, the medieval bishops’ palace was once one of the most important buildings in England. As the administrative centre of the largest diocese in the country, its architecture reflected the enormous power and wealth of the bishops as princes of the church. Built by St Hugh before 1200, the East Hall range is the earliest example of a roofed domestic hall in the country. The chapel range and entrance tower were built by Bishop William Alnwick, who modernised the palace in the 1430s. Having hosted visits from Henry VIII and James I, the palace was sacked by royalist troops during the Civil War in 1648. Built on hillside terraces, it has views of the cathedral and the Roman, medieval and modern city.